Steering Wheel Switches Market size was valued at over USD 3 billion in 2016 and its demand is predicted to cross 500 million units by 2024. Increasing accident rates are observed due to distraction of driver for operating distinct functions in the vehicle. Manufacturers have analysed that controls on the steering wheel will enhance safety of the driver and its passengers. Increasing safety features will enhance the steering wheel switches market size over the forecast timeframe. Applications such as infotainment, ADAS, onboard computer, and telephone is increasing the number of switches to be incorporated to offer driver with all controls on his fingertips. In addition, reduced size of the product will facilitate manufacturers to employ more number of buttons. This will boost the steering wheel switches market share over the projected time span. Developed countries such as Germany, France, UK, and the U.S., have high usage of luxury cars and sports cars which employ more than 10 buttons in each vehicle. Substantial increase in sales of these vehicles along with extra comfort features will promote the industry size over the forecast period. Steering wheel switches market size is predicted to foster globally over the study period due to customization per vehicle along with changing customer preferences in style trends. This can be attributed to customization offering aesthetic appeal and rising disposable income to the individual’s vehicle. Usage of optical sensors embedded in the vehicle allows the driver to operate several functions by using motions and gestures coupled with zForce concept. Increasing technological innovations may reduce the number of buttons to be employed in a car. This may affect the growth of steering wheel switches market size by 2024. Industry participants are focusing on developing an automated car without any steering wheel which may slowdown the industry growth rate over the projected time span. For instance, in January 2018, General Motors announced to launch Robocars without steering wheels in 2019. In addition, Google’s self-driving car Waymo will be introduced in 2018. Passenger cars segment will exhibit around 4% CAGR of steering wheel switches market from 2017 and 2024. This can be credited to increasing number of applications such as infotainment and driver information. Increasing interest of customers in sports car and luxury cars is contributing significantly in the segment revenue generation. Light commercial vehicles (LCVs) segment is estimated to generate over USD 300 million in 2024 owing to increasing number of vehicles used for goods and passenger transportation. Optimized driver experience and developing easy to use & safe operation will boost the segment growth over the forecast time span. Push buttons sector is projected to dominate industry volume share owing to its high requirement in various applications. For instance, in June 2017, Honda demonstrated its new product Acura RLX sedan car, the driver will be able to shift into self-driving mode by using push button employed on its steering wheel. Seesaw switch is expected to pose a CAGR of more than 3% from 2017 and 2024. This can be attributed to its usage in controlling audio and cruise functions in the vehicle. Increasing customer preferences for entertainment while driving will surge the segment growth over the forecast period. OEM segment in the steering wheel switches market will pose a CAGR of over 3% during the study period. OEMs dominate the industry share owing to increasing automobile production across the globe. Rising disposable income leads the customers to customize various functions in their vehicle thereby improving the industry size. Technological advancements are increasing number of switches to be incorporated for multiple applications such as automatic climate controls, speed control, vehicle information, etc. In addition, increasing sales of premium and sports cars positively contributes segment growth. Aftermarket segment is estimated to generate over USD 600 million by 2024. Easy availability and provision of lesser prices of the aftermarket products spurs the sector revenue generation. Online portals are gaining traction for the replacement of small automotive parts requiring minimum tools. High competition is observed between retailers, distributors, and component suppliers. Asia Pacific steering wheel switches market is expected to account for over 40% volume share by 2024. Rising automobile production across the region, especially in emerging economies such as India and China are driving the industry growth. Presence of multiple component manufacturers in the region is fuelling regional growth. Europe is expected to pose over 4% CAGR in the steering wheel switches industry over the projected time span. Presence of major giant automobile manufacturers in the region is primarily driving the regional growth. Continuous technological advancements for offering enhanced driving safety is contributing in the overall business demand. Steering wheel switches market participants are Delphi, ZF, Valeo, ALPS, Tokai Rika, and Panasonic Automotive. Industry players are focusing on collaborating with automobile manufacturers. For instance, DAESUNG offers its products to all the vehicles of Kia, Nissan, and Hyundai. Industry participants witness intense competition level from local manufacturers as they offer similar products in lower rates. Moreover, players are required to focus on online product sales via various e-commerce websites such as E-bay, Amazon, dhgate, Autozone, etc. Online channel may support in rising sales for individual customers. 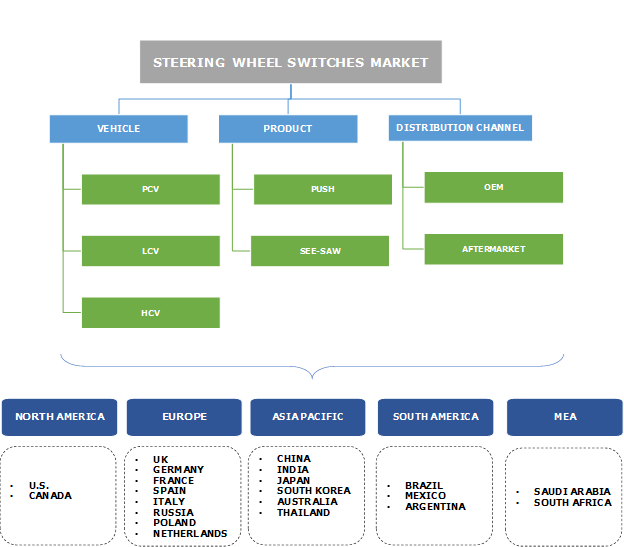 Several steering wheel switches market players are engaged in mergers and acquisitions to enhance their product portfolio and increase customer base. For instance, in June 2012 Littelfuse acquired ACCEL which is a manufacturer and supplier of steering wheel switches. Major component manufacturers such as Delphi, Omron have adopted e-commerce channels for increasing their product sales.